Abstract. Methane emissions inventories for Southern California's South Coast Air Basin (SoCAB) have underestimated emissions from atmospheric measurements. To provide insight into the sources of the discrepancy, we analyze records of atmospheric trace gas total column abundances in the SoCAB starting in the late 1980s to produce annual estimates of the ethane emissions from 1989 to 2015 and methane emissions from 2007 to 2015. The first decade of measurements shows a rapid decline in ethane emissions coincident with decreasing natural gas and crude oil production in the basin. Between 2010 and 2015, however, ethane emissions have grown gradually from about 13±5 to about 23±3Ggyr−1, despite the steady production of natural gas and oil over that time period. 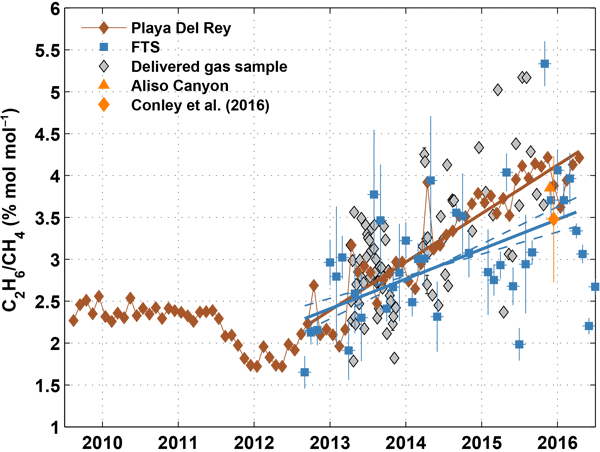 The methane emissions record begins with 1 year of measurements in 2007 and continuous measurements from 2011 to 2016 and shows little trend over time, with an average emission rate of 413±86Ggyr−1. 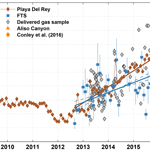 Since 2012, ethane to methane ratios in the natural gas withdrawn from a storage facility within the SoCAB have been increasing by 0.62±0.05%yr−1, consistent with the ratios measured in the delivered gas. Our atmospheric measurements also show an increase in these ratios but with a slope of 0.36±0.08%yr−1, or 58±13% of the slope calculated from the withdrawn gas. From this, we infer that more than half of the excess methane in the SoCAB between 2012 and 2015 is attributable to losses from the natural gas infrastructure. How to cite: Wunch, D., Toon, G. C., Hedelius, J. K., Vizenor, N., Roehl, C. M., Saad, K. M., Blavier, J.-F. L., Blake, D. R., and Wennberg, P. O.: Quantifying the loss of processed natural gas within California's South Coast Air Basin using long-term measurements of ethane and methane, Atmos. Chem. Phys., 16, 14091-14105, https://doi.org/10.5194/acp-16-14091-2016, 2016. This paper investigates the cause of the known underestimate of bottom-up inventories of methane in California's South Coast Air Basin (SoCAB). We use total column measurements of methane, ethane, carbon monoxide, and other trace gases beginning in the late 1980s to calculate emissions and attribute sources of excess methane to the atmosphere. We conclude that more than half of the excess methane to the SoCAB atmosphere is attributable to processed natural gas.